Although he comes from a family in which the last three generations have been part of the Sumo world, Katsumi Nakano discovers it somewhat by chance, when visiting Sadogatake beya with a yobidashi as his guide. It is an immediate revelation and he begins training very rapidly from that time on. In March 1987, as he celebrates his 15th birthday, he makes his professional debut in the Haru basho under the shikona of Kotonakano. Like the majority of rikishi who make their debut at such a young age, it takes him many tournaments to achieve Sekitori status. It finally comes about at the July 94 tournament at Nagoya, after more than seven years of trying. A losing record forces him to return to Makushita, however, where this lightweight wrestler spends another four tournaments. His return at the Natsu basho of May 95 will be a winning one and he will become established from that point in the top two divisions. Six tournaments in Juryo and five kachi-koshi later, he at last earns his promotion to Makuuchi. This oshi-zumo specialist attempts to make up for his lack of weight by keeping a constant mobility on the dohyo and by his unusual strength. Each time he uses a tsuridashi move, he attracts the public�s encouragement when he carries his opponent large distances like the famous Kirishima. 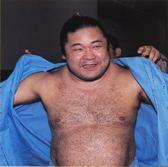 At the Hatsu basho of January 1997, as Maegashira 11 west, he finishes at 10-5 and is rewarded with the fighting spirit prize. Two years later he again starts the year well, celebrating his first �gold star� by beating Takanohana on the 10th day. 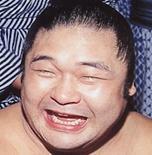 At the Natsu basho in May the same year, Kotoryu suffers his first injury in his 7th day bout against Tamakasuga. But a knee injury is not going to stop him from continuing bravely! He manages to complete the tournament with a score of 5-10, which is honourable under the circumstances. In January 2000, on the 2nd day, in a fine bout, he wins his second kinboshi, against Musashimaru, with a very authoritative yorikiri. On the following day he disposes of Ozeki Chiyotaikai in the same way. When one knows the quality and career-achievements of the rikishi who occupy the top of the banzuke at this tournament, his score of 6-9 at Maegashira 1 can be seen as a worthy performance on his part. The injuries are not over, because in March 2001 at the Haru basho, he fractures the same elbow on the 6th day against Kaio. And at the end of the year at the Kyushu basho, as he is climbing back up the hierarchy, he gets injured again in his win over Tochinonada on shonichi. This time it is the cruciate ligaments in the knee that are affected and he must withdraw from the rest of the tournament. He must also abandon the January 2002 tournament. At his return in March, he has fallen back down to Juryo. By winning the yusho, which will be the only one in his career, he proves that he belongs in the higher division. A new injury soon hits him, on senshuraku at the next Natsu basho against Oikari. He tears the arch of his foot and will be absent for the next tournament. The September 2002 tournament, the Aki basho, allows him to celebrate one last �gold star� on the 5th day against Takanohana for whom it is a return after 16 months� absence. In his 18-year career he has shown a great deal of courage and strength of will, winning 3 kinboshi and 6 ginboshi. Although he gained no advantage from any physical attribute, despite gaining weight during the last years of his career, he succeeded by dint of courage, to remain a Sekitori for 10 years. Suffering for some years from diabetes, like Yokozuna Takanosato, current Naruto Oyakata, he today leaves the professional Sumo world to look after his hypertension and his liver problems. Let us wish him a speedy recovery so that he can continue to develop young wrestlers like Kotooshu with his experience, to stamp his strength of character on them and perhaps hold the position of Oyakata in one of the heya. Congratulations, you really deserve your retirement, Mr Kotoryu.